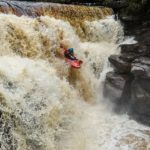 Pyranha 9r II | DBP MAGAZINE ONLINE The World's Best Free Whitewater Publication. Could the long awaited Pyranha 9r II (Two) be on the way? It’s in Pyranhas custom order sheet as an option, so surely can’t be far off. Maybe the delay was due to making more changes – the OG 9r was a really popular design, and they would want to get this one right.